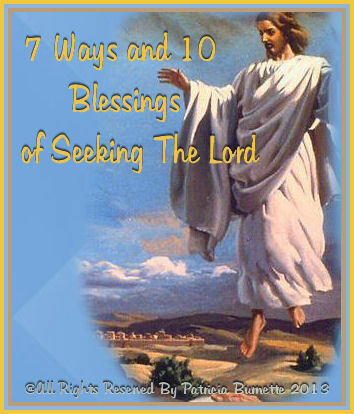 "7 Ways and 10 Blessings of Seeking The Lord"
Welcome to "7 Ways and 10 Blessings of Seeking The Lord"
God has so many Blessings to give each and everyone of us, only thing is "we have to want them" but so many could care less because they will not "turn their lives over to God." He does have a few stipulations in order to get those blessings, but.... you have to "Accept Jesus Christ" as your "Personal Savior" first. I have listed "7 Ways and 10 Blessings Of Seeking The Lord" all you have to do as I mentioned is "Receive Jesus Christ as Your Lord and Savior" that is a big thing, but Jesus did a GREAT THING for you He Gave HIS LIFE for you!